Bring beef stock, Chinese 5 spice, sesame oil, soy sauce, salt and pepper to a boil in a pot. Bring down heat and allow to simmer for 20 minutes. Meanwhile, make sure your beef is very cold so it's easier to cut (One trick is putting it int he freezer for 30 minutes or so before so it is easier to cut). . Slice it paper thin vertically for long slices. Prepare your soup toppings, rinse, slice and chop anything necessary. Prepare Udon Noodles according to their package (bring water and seasoning to a boil, add noodles and cook for 3-4 minutes). Do not drain noodles. Keep the broth that has created. When broth has simmered for 20 minutes. divide out 1/2 the sliced steak and 1/2 the noodles (with their cooking broth) into 2 bowls. Pour beef broth over the beef (this will cook the beef) and noodles. Top with your selected herbs and spices. I took the challenge! That is the Fortune Udon Noodle challenge with JSL Foods. 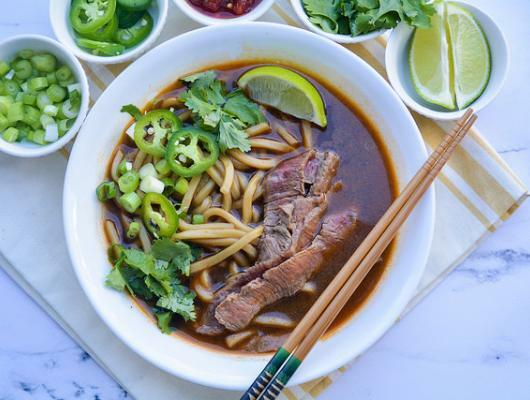 They had participating bloggers develop original recipes using their udon noodles for a chance at a very generous grand prize (you can purchase JSL Foods products at (Acme, Safeway, Albertsons, Price Rite and Shop Rite). So today’s recipe is both my entry and a great recipe to share with all of you! 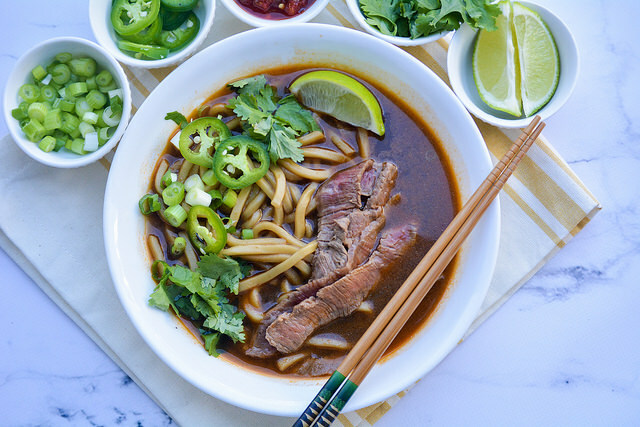 20 Minute Udon Noodle Pho Bowls will become a fast favorite meal. I love soups when it's cold outside. What I love even more than a warm bowl of soup, is one that helps when I have cold, too! Pho, a Vietnamese noodle soup, is one of those bowls that is all-healing. It’s got those exotic Asian spices and some heat to clear out your head and warm your belly! And while traditionally it is served with thin rice noodles, I thought it would be a fun fusion idea to use Fortune’s Udon Noodles for a little hint of Japanese. It makes the soup a little more hearty paired with shaved slices of beef and topped with herbs. I loved this combination. We ate it three times in one week it was so good. The best part of all is that the whole soup from start to finish takes just 20 minutes. Talk about a weeknight meal win! Now before I share the recipe you need to understand that traditional Pho is not just about the meaty broth, shaved beef, and noodles. It’s also about the toppings. The addition of herbs, citrus and spices to the soup provides even more layers of complexity and flavor.